Aromatic and fluffy. 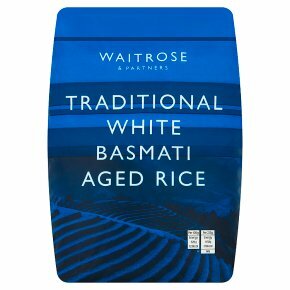 The prince of rices, with a delicate but distinctive flavour produced by the fertile soil, snow-fed streams and pure air of the Himalayan foothills. Fragrant and fluffy, its perfect as a partner to curries and spicy sauces. Hob. Time: 10 -12 mins. Rinse 57g of rice per person in running water. Place in saucepan with double the amount of water. Add salt if desired. Bring to the boil. Cover and simmer gently for 10 -12 minutes. Fluff up with fork. Drain thoroughly before serving. 57g of dry rice gives approximately 180g rice when cooked.